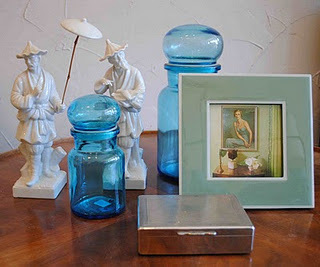 It's my main man's B-day today so thought I'd whip up a little post on the lastest finds in his shop, ChairTableLamp. 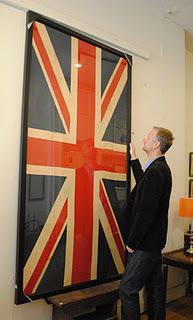 First up, that supercool overscaled Union Jack. And yes, he is well aware that it is hanging sideways -- he likes to mess things up a bit - give an object his own interpretation. Not sure the protectors of the UJ would feel too good about this little trick, but whatevs. Trust me, if we had a wall large enough, we'd have kept this one. BTW for scale, Kevin is 6ft 3ins. Those Blanc de Chine figures are just so exquisite. And how about the picture in that frame? Kevin never leaves his picture frames blank. He always finds just the right page from a magazine or falling apart book to complement the frame. This picture shows a David Hicks interior with a painted portrait of Lady Mountbatten. I like to think that Mr. Hicks - the godfather of tablescaping - would aprove of Kevin's arrangement. 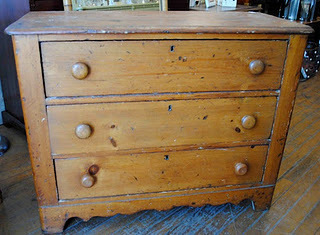 A 3-drawer chest is the little black dress of furniture. We can all use a great one -- or several. This pine pretty is rustic perfection and the price KILLS - $395. All this to say: Happy Birthday Kevin! You continue to astound me with your incredible eye for beauty and quality. So proud and so thankful.